Durante degli Alighieri (Italian: [duˈrante deʎʎ aliˈɡjɛːri]), simply called Dante (Italian: [ˈdante], UK /ˈdænti/, US /ˈdɑːnteɪ/; c. 1265 – 1321), was a major Italian poet of the Late Middle Ages. His Divine Comedy, originally called Comedìa (modern Italian: Commedia) and later christened Divina by Boccaccio, is widely considered the greatest literary work composed in the Italian language and a masterpiece of world literature. In the late Middle Ages, the overwhelming majority of poetry was written in Latin, and therefore accessible only to affluent and educated audiences. 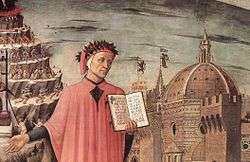 In De vulgari eloquentia (On Eloquence in the Vernacular), however, Dante defended use of the vernacular in literature. He himself would even write in the Tuscan dialect for works such as The New Life (1295) and the aforementioned Divine Comedy; this choice, although highly unorthodox, set a hugely important precedent that later Italian writers such as Petrarch and Boccaccio would follow. As a result, Dante played an instrumental role in establishing the national language of Italy. 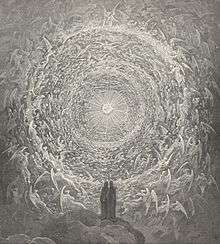 Dante's significance also extends past his home country; his depictions of Hell, Purgatory, and Heaven have provided inspiration for a large body of Western art, and are cited as an influence on the works of John Milton, Geoffrey Chaucer and Alfred Tennyson, among many others. In addition, the first use of the interlocking three-line rhyme scheme, or the terza rima, is attributed to him. Dante has been called "the Father of the Italian language" and one of the greatest poets of world literature. In Italy, Dante is often referred to as il Sommo Poeta ("the Supreme Poet") and il Poeta; he, Petrarch, and Boccaccio are also called "the three fountains" or "the three crowns". Dante was born in Florence, Republic of Florence, present-day Italy. The exact date of his birth is unknown, although it is generally believed to be around 1265. This can be deduced from autobiographic allusions in the Divine Comedy. 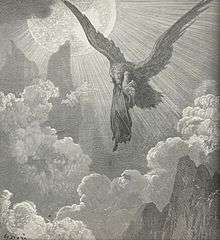 Its first section, the Inferno, begins, "Nel mezzo del cammin di nostra vita" ("Midway upon the journey of our life"), implying that Dante was around 35 years old, since the average lifespan according to the Bible (Psalm 89:10, Vulgate) is 70 years; and since his imaginary travel to the nether world took place in 1300, he was most probably born around 1265. Some verses of the Paradiso section of the Divine Comedy also provide a possible clue that he was born under the sign of Gemini: "As I revolved with the eternal twins, I saw revealed, from hills to river outlets, the threshing-floor that makes us so ferocious" (XXII 151–154). In 1265, the sun was in Gemini between approximately May 11 and June 11. Dante fought with the Guelph cavalry at the Battle of Campaldino (June 11, 1289). This victory brought about a reformation of the Florentine constitution. To take any part in public life, one had to enroll in one of the city's many commercial or artisan guilds, so Dante entered the Physicians' and Apothecaries' Guild. In the following years, his name is occasionally recorded as speaking or voting in the various councils of the republic. 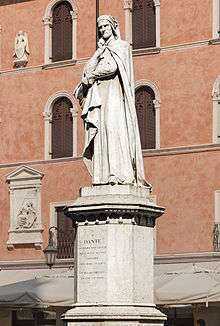 A substantial portion of minutes from such meetings in the years 1298–1300 was lost, however, so the true extent of Dante's participation in the city's councils is uncertain. Dante said he first met Beatrice Portinari, daughter of Folco Portinari, at age nine, and claimed to have fallen in love with her "at first sight", apparently without even talking with her. He saw her frequently after age 18, often exchanging greetings in the street, but never knew her well. In effect, he set an example of so-called courtly love, a phenomenon developed in French and Provençal poetry of prior centuries. Dante's experience of such love was typical, but his expression of it was unique. It was in the name of this love that Dante left his imprint on the dolce stil novo (sweet new style, a term which Dante himself coined), and he would join other contemporary poets and writers in exploring never-before-emphasized aspects of love (Amore). Love for Beatrice (as Petrarch would show for Laura somewhat differently) would be his reason for poetry and for living, together with political passions. In many of his poems, she is depicted as semi-divine, watching over him constantly and providing spiritual instruction, sometimes harshly. When Beatrice died in 1290, Dante sought refuge in Latin literature. The Convivio chronicles his having read Boethius's De consolatione philosophiae and Cicero's De Amicitia. He then dedicated himself to philosophical studies at religious schools like the Dominican one in Santa Maria Novella. He took part in the disputes that the two principal mendicant orders (Franciscan and Dominican) publicly or indirectly held in Florence, the former explaining the doctrines of the mystics and of St. Bonaventure, the latter expounding on the theories of St. Thomas Aquinas. An early outside indication that the poem was under way is a notice by Francesco da Barberino, tucked into his Documenti d'Amore (Lessons of Love), written probably in 1314 or early 1315. Speaking of Virgil, Francesco notes in appreciative words that Dante followed the Roman classic in a poem called "Comedy" and that the setting of this poem (or part of it) was the underworld; i.e., hell. The brief note gives no incontestable indication that he himself had seen or read even the Inferno or that this part had been published at the time, but it indicates composition was well under way and that the sketching of the poem might have begun some years before. (It has been suggested that a knowledge of Dante's work also underlies some of the illuminations in Francesco da Barberino's earlier Officiolum [c. 1305–08], a manuscript that came to light only in 2003.) We know that the Inferno had been published by 1317; this is established by quoted lines interspersed in the margins of contemporary dated records from Bologna, but there is no certainty as to whether the three parts of the poem were each published in full or, rather, a few cantos at a time. Paradiso seems to have been published posthumously. In 1312 Henry assaulted Florence and defeated the Black Guelphs, but there is no evidence that Dante was involved. Some say he refused to participate in the assault on his city by a foreigner; others suggest that he had become unpopular with the White Guelphs, too, and that any trace of his passage had carefully been removed. 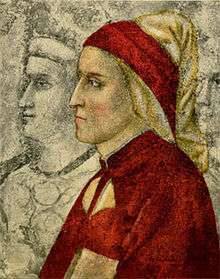 Henry VII died (from a fever) in 1313, and with him any hope for Dante to see Florence again. He returned to Verona, where Cangrande I della Scala allowed him to live in certain security and, presumably, in a fair degree of prosperity. Cangrande was admitted to Dante's Paradise (Paradiso, XVII, 76). During the period of his exile Dante corresponded with Dominican theologian Fr. Nicholas Brunacci OP [1240-1322] who had been a student of Thomas Aquinas at the Santa Sabina studium in Rome, and later at Paris. and of Albert the Great at the Cologne studium. Brunacci became lector at the Santa Sabina studium, forerunner of the Pontifical University of Saint Thomas Aquinas, and later served in the papal curia. 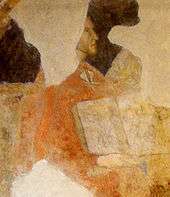 Alighieri accepted Prince Guido Novello da Polenta's invitation to Ravenna in 1318. He finished Paradiso, and died in 1321 (aged 56) while returning to Ravenna from a diplomatic mission to Venice, possibly of malaria contracted there. He was buried in Ravenna at the Church of San Pier Maggiore (later called San Francesco). Bernardo Bembo, praetor of Venice, erected a tomb for him in 1483. The Divine Comedy describes Dante's journey through Hell (Inferno), Purgatory (Purgatorio), and Paradise (Paradiso); he is first guided by the Roman poet Virgil and then by Beatrice, the subject of his love (and of another of his works, La Vita Nuova). While the vision of Hell, the Inferno, is vivid for most modern readers, the theological niceties presented in the other books require a certain amount of patience and knowledge to appreciate. 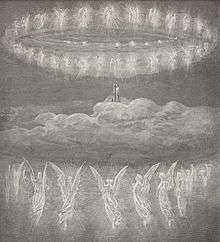 Purgatorio is arguably the most lyrical of the three, referencing more contemporary poets and artists than Inferno; Paradiso is the most heavily theological, and the one in which, many scholars have argued, the Divine Comedy's most beautiful and mystic passages appear (e.g., when Dante looks into the face of God: "all'alta fantasia qui mancò possa"—"at this high moment, ability failed my capacity to describe," Paradiso, XXXIII, 142). New readers often wonder how such a serious work may be called a "comedy". In the classical sense the word comedy refers to works which reflect belief in an ordered universe, in which events tend toward not only a happy or amusing ending but one influenced by a Providential will that orders all things to an ultimate good. By this meaning of the word, as Dante himself wrote in a letter to Cangrande I della Scala, the progression of the pilgrimage from Hell to Paradise is the paradigmatic expression of comedy, since the work begins with the pilgrim's moral confusion and ends with the vision of God. ↑ Haller, Elizabeth K. (2012). 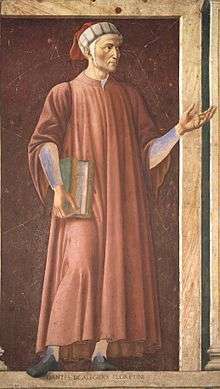 "Dante Alighieri". In Matheson, Lister M. Icons of the Middle Ages: Rulers, Writers, Rebels, and Saints. 1. Santa Barbara, CA: Greenwood. p. 244. ISBN 978-0-313-34080-2. 1 2 3 4 Chimenz, S.A. Alighieri, Dante. Dizionario Biografico degli Italiani (in Italian). Enciclopedia Italiana. Retrieved 2016-03-07. ↑ Santagata, Marco (2012). Dante: Il romanzo della sua vita. Milan: Mondadori. p. 21. ISBN 978-8804620266. 1 2 Davenport, John (2005). Dante: Poet, Author, and Proud Florentine. Infobase Publishing. p. 53. ISBN 978-1-4381-0415-7. Retrieved 2016-03-07. ↑ "Guelphs and Ghibellines". Dante Alighieri Society of Massachusetts. Retrieved 30 December 2015. ↑ Malcolm Moore "Dante's infernal crimes forgiven", Daily Telegraph, June 17, 2008. Retrieved on June 18, 2008. ↑ See Bookrags.com and Tigerstedt, E.N. 1967, Dante; Tiden Mannen Verket (Dante; The Age, the Man, the Work), Bonniers, Stockholm, 1967. ↑ Fabio M. Bertolo (2003). "L′Officiolum ritrovato di Francesco da Barberino". Spolia—Journal of Medieval Studies. Retrieved August 18, 2012. ↑ History of Italian Philosophy, Volume 1, 85, by Eugenio Garin, https://books.google.com/books?id=sVP3vBmDktQC&pg=PA85&lpg=PA85&dq=brunacci#v=onepage&q=brunacci&f=false Accessed June 29, 2011; http://www.brunacci.it/s--tommaso.html Accessed June 22, 2011: "Per l'acutezza del suo ingegno, dopo aver studiato nella sua provincia, ebbe l'alto onore di accompagnare S. Tommaso a Parigi nel novembre del 1268. Rimase in quello studio fino al 1272 e di là passò a Colonia sotto la disciplina di Alberto Magno." 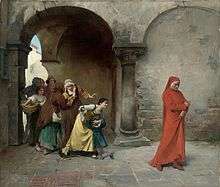 ↑ "Dante Alighieri". The Catholic Encyclopedia. Retrieved May 2, 2010. ↑ Vauchez, André; Dobson, Richard Barrie; Lapidge, Michael (2000). Encyclopedia of the Middle Ages. Chicago: Fitzroy Dearborn Publishers. p. 1517. ; Caesar, Michael (1989). Dante, the Critical Heritage, 1314(?)–1870. London: Routledge. p. xi. 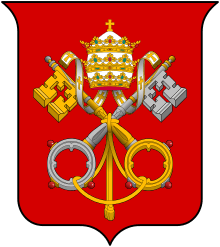 ↑ "In praeclara summorum: Encyclical of Pope Benedict XV on Dante". The Holy See. Retrieved Nov. 7, 2014. ↑ Pullella, Philip (January 12, 2007). "Dante gets posthumous nose job – 700 years on". Statesman. Reuters. Retrieved November 5, 2007. ↑ Benazzi, S (2009). 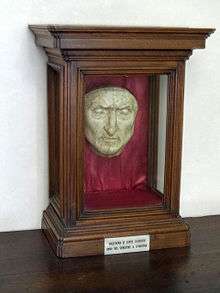 "The Face of the Poet Dante Alighieri, Reconstructed by Virtual Modeling and Forensic Anthropology Techniques". Journal of Archaeological Science. 36 (2): 278–283. doi:10.1016/j.jas.2008.09.006. ↑ "Messaggio del Santo Padre al Presidente del Pontificio Consiglio della Cultura in occasione della celebrazione del 750° anniversario della nascita di Dante Alighieri". Press.vatican.va. Archived from the original on 2015-05-04. Retrieved 2015-10-21. ↑ "Translator". Microsofttranslator.com. Retrieved 2015-10-21. ↑ "Banquet". Dante online. Retrieved September 2, 2008. ↑ "Monarchia". Dante online. Retrieved September 2, 2008. ↑ Anthony K. Cassell The Monarchia Controversy. The Monarchia stayed on the Index Librorum Prohibitorum from its inception until 1881. ↑ Giuseppe Cappelli, La divina commedia di Dante Alighieri, in Italian. ↑ "De vulgari Eloquentia". Dante online. Retrieved September 2, 2008. ↑ "New Life". Dante online. Retrieved September 2, 2008. Gardner, Edmund Garratt (1921). Dante. London: Oxford University Press. OCLC 690699123. Retrieved 2016-03-07. Toynbee, Paget (1898). A Dictionary of the Proper Names and Notable Matters in the Works of Dante. London: The Clarendon Press. OCLC 343895. Retrieved 2016-03-07. Wetherbee, Winthrop. 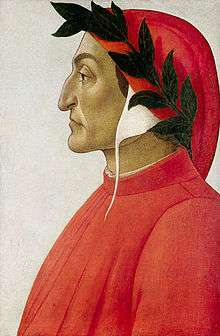 "Dante Alighieri". Stanford Encyclopedia of Philosophy.